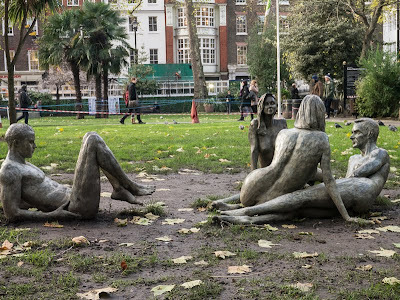 I don't know if these figures have recently appeared in Soho square or if I have only noticed them as they seem a little odd lying naked in the mud. They are the work of sculptor Bruce Denny. His work explores human form and emotion, he aims to inspire us to think about ourselves and the lives we live. Is his questioning inspired by his earlier career in the city? Looks a bit freezy in winter, but it is very special. Have never seen something like this before. Is that one statue doing leg-pull-ups for his abs? Bit cold to be lying around naked. I hope they're not brass because in this weather the guys will be looking for a welder!! Dont know if they were there last time I went, only a few weeks ago. Perhaps they keep changing the statues. They almost look like they've emerged right out of the mud. They seem very relaxed, I think these sculptures look very nice. I rather enjoy these, actually. I love good sculpture, especially when it pushes the envelope!